5845 is the number that shook the culinary world last December 14, 2009, when it broke the Guiness World Record for the most number of dishes using cheese as one of the ingredients. 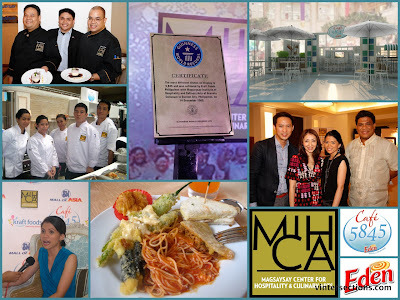 Magsaysay Center for Hospitality and Culinary Arts (MIHCA) and Kraft Eden Cheese successfully created 5,845 unique cheese-infused dishes in one day. India was the record holder prior to this record-breaking milestone of the Filipinos. The two renowned institutions collaborate and thus birthed Café 5845 which was launched on July 22, 2010. “It is the world’s first cheese café that will serve the most number of cheese dishes at 5,845. We wanted to share to our fellow Filipinos the joy of tasting 5,845 unique cheese-based dishes that we prepared for the World Record event,” Chef Giovasco C. Barlao, VP and Head for Operations--MIHCA proudly says. Spearheaded by MIHCA and Kraft Eden Cheese, Café 5845 promises the public a record-setting dining experience. “Everyday, we will have a different menu featuring some of the dishes used in the record-breaking 5,845 dishes–guests would be too intrigued not to come back for more,” Chef Barlao explains. With pasta such as Penne Amatriciana with Shrimp & Mushroom, BBQ Pork w/ Cheesy Bechamel Sauce as one of the main courses, Vegetarian pizzas to satisfy vegetarian guests and of course, sandwiches such as Chicken and Cheese Panina lined up in the menu, guests are sure to indulge in a unique dining experience. Café 5845 is located in SM Mall of Asia (North Living Seaside Boulevard area). "Everyone, people from all walks of life, may get a taste of the unique and scrumptious dishes served only at Café 5845,” says Alex Dan Tacderas, Category Manager for Cheese and Spoonables-Kraft Foods Philippines. Moreover, the café’s architectural design is reminiscent of a quiet and classy European café–complete with an impeccable view of the Manila Bay by its side. “We also considered design and location because they are vital in giving the whole venue a full 360,” testifies Tacderas. The combination of Kraft Foods (http://www.kraftfoodscompany.com) and Cadbury creates a global powerhouse in snacks, confectionery and quick meals. With annual revenues of approximately $50 billion, the combined company is the world’s second largest food company, making delicious products for billions of consumers in more than 160 countries. Please visit http://sarapngbuhay.com for more details.